First Glimpses: NTR & LP In Lakshmi's NTR! Unfortunately, Telugu People has't shown much interest in watching 'NTR Kathanayakudu'. The buzz for 'NTR Mahanayakudu' appears to be too low after the dismal Box Office performance of Part 1. Makers might delay the release by few weeks instead of releasing it on February 7th. In fact, More people are curious about 'Lakshmi's NTR' after the Teaser Launch. 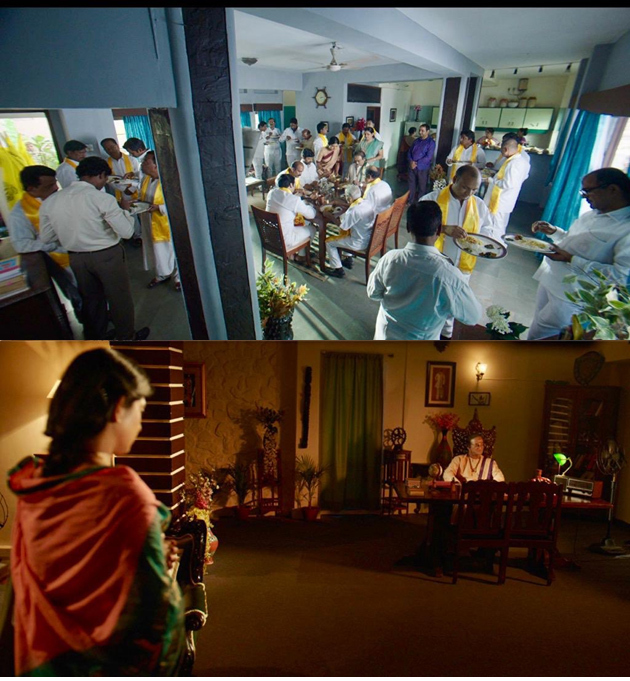 Two Stills shared by Ram Gopal Varma on his Twitter handle have been generating good buzz. While Lakshmi Parvathi was found serving food to NTR, Babu & TDP Leaders in one of them, The other one reflects the bonding between NTR & Lakshmi Parvati. RGV had earlier thought of releasing 'Lakshmi's NTR' on January 24th. He, however, seems to have failed to meet the deadline. In his recent interview, Varma informed Trailer of 'Lakshmi's NTR' arrives in the last week of January or first week of February. Which means, The controversial flick would hit the screens either in the second half of February or in the month of March. This could be a strategic move considering the fact that there could a delay in the release of 'NTR Mahanayakudu'.